The below is a letter to the Editor of the Providence Journal in response to David Brussat’s editorial “Little Red School and the Big Bad Wolf.” As of this date, the ProJo has not printed the letter. 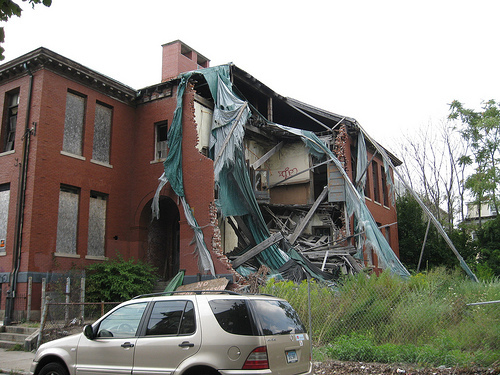 In David Brussat’s “Little Red School and the Big Bad Wolf,” 1/13/2011, he portrays a disturbing instance of demolition by neglect of Federal Hill’s historic Grove Street School. The owner of the Grove Street School, Representative Michael Tarro, has been a blatantly irresponsible building owner defying city law all the while as an Assistant City Solicitor of Providence. The Taveras administration defines, the city solicitor is responsible for “implementing all legal policies and procedures of the city to ensure that municipal services and activities are conducted in accordance with city policy and ordinance” as quoted in the Providence Journal in “Mayor appoints Padwa to city solicitor post,” 1/15/2011. It is unconscionable that Michael Tarro continues to hold a position of enforcing city laws he himself willfully chooses to disobey, despite losing every battle in court over the past four years. As a former resident of Providence who could see the Grove Street School, a mere city lot away, from my own home, I am appalled that this issue is still not resolved and that the building continues to be open to the harsh elements. Mayor Taveras, please secure this property to prevent further deterioration of a viable piece of Providence’s history, put a lien on the building for the cost of such a task, and get Michael Tarro off the city payroll. Unfortunately, getting him off the city payroll is more difficult now that he’s an elected representative of the district he is seeking to weaken. I hope you consider this post to be a petition, and if so, I hereby sign it. Back when he won the primary he pasted yellow slips with black text that had “Thank you!” printed on them. I have a feeling he’s going to be a one term representative. If people were stupid enough to vote for him once, they’re stupid enough to keep doing it. I still wish I had stolen his campaign signs and tied them to the fence surrounding the school.